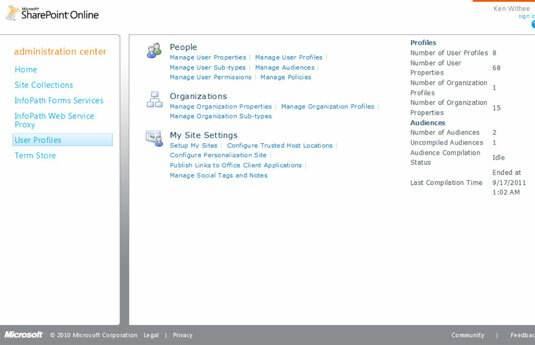 The SharePoint Online management screen is also called the SharePoint Administration Center. You can access this screen by clicking the Manage link under the SharePoint Online section of the Office 365 management screen. The SharePoint Administration Center provides the ability to manage site collections, configure InfoPath Form Services, manage user profiles, and manage the SharePoint Term Store. The SharePoint Administration Center is unique to the enterprise versions of the Office 365 product. If you are using the professional/small business plan, then you have a single site collection. A SharePoint site collection is a logical collection of SharePoint websites. A site collection isolates SharePoint components, such as user permissions, navigational components, and content types. You may want a site collection for sensitive areas of the organization, such as Accounting or Human Resources and then a separate site collection for the general company portal. The site collection management screen lets you create and configure site collections. In particular, you can perform tasks, such as assigning site collection administrators, allocating resources, and setting resource, and domain information. InfoPath is a component of Microsoft Office that provides the ability to create interactive forms without needing to write programming code. The component of SharePoint responsible for integrating InfoPath forms with SharePoint is called InfoPath Form Services. The InfoPath Form Services configuration screen provides the ability to allow users to enable InfoPath forms in the web browser, render forms based on InfoPath templates, and specify which user agents will receive forms in a searchable format known as eXtensible Markup Language or XML. Some of the options include sending the XML data to Google, MSN Search, or Yahoo. The user profile page provides the ability to manage SharePoint Online components that relate to user profiles, such as the ability to manage people, the organization, and the configuration settings for the personal SharePoint site functionality known as My Site. The People section lets you manage user properties and user profiles. You can create new profiles and edit existing profiles. In addition, you can manage audiences, user permissions, and policies. An audience is a grouping of users that match specific criteria. For example, you might create a policy for everyone with the department property of their profile set to Executive. You could then target specific SharePoint functionality for only this audience. A policy provides specific functionality for users, such as the ability to add colleagues to their profiles themselves. The Organizations section of the User Profiles screen lets you manage the properties and profiles of the organization. For example, one of the properties of the organization might be the company logo, and another property might be the physical address or web address. By using this screen, you can create new properties or edit existing properties. The profiles section lets you manage a separate profile for different departments. An easy way to think of properties and profiles throughout SharePoint is that properties define the fields used in the profiles. For example, a property might be First Name, and the profile would use this property but would associate Ken Withee with the property in the profile. A SharePoint My Site is a personal site for every single user. A My Site allows users to create their own SharePoint space without worrying about having the right administrative access to a shared site. The My Site section provides the ability to set up and configure the My Site functionality for SharePoint Online.